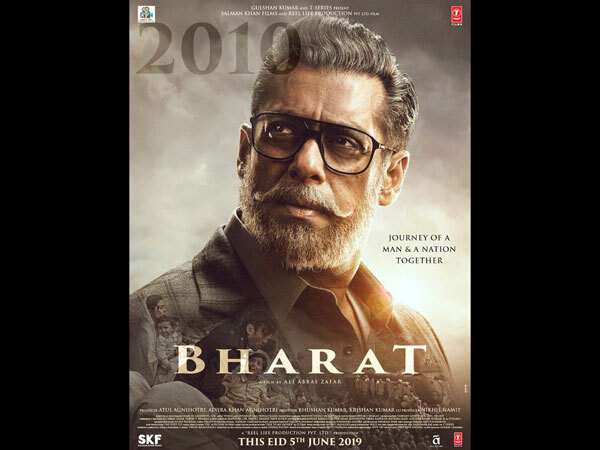 The makers of Bharat released a new poster for the film and it depicts Salman as an aged man. Today, Salman took to his Twitter page and shared the new poster from Bharat which will leave you surprised. Salman Khan shared the poster on his social media saying, " Jitne safed baal mere sar aur dhaadi mein hain, usse kahin zyada rangeen meri zindagi rahi hain! Bollywood Megastar Salman Khan is gearing up for the release of the most challenging film of his career, Bharat. For the first time ever, Salman can be seen donning a bearded look in the poster of a film. On Sunday, Katrina had posted a picture on Instagram from the sets of the drama-adventure film. As the film is now three months away from its release, the makers want to give a glimpse of the film way ahead of the release. Including stellar performers like Salman Khan, Katrina Kaif, Disha Patani, Tabu, and Sunil Grover, the Ali Abbas Zafar directorial boasts of an ensemble cast promising power-packed performances. This will be exciting for the fans who are excited to see Salman Khan sporting different looks which they got to see in the teaser. On Sunday, the film's leading lady Katrina Kaif also shared a still from the film. The film will showcase several landmark events in India's history which will be revisited in the film which spans six decades and is the official remake of the South Korean film, Ode To My Father. The film's trailer will be released on April 26 2019, when Avengers: Endgame hit the theatres across the country.